Macdara plays Older Joe in SONG OF GRANITE (Best Cinematography in an Irish Feature Galway Film Fleadh 2017) directed by Pat Collins for Road Entertainment. 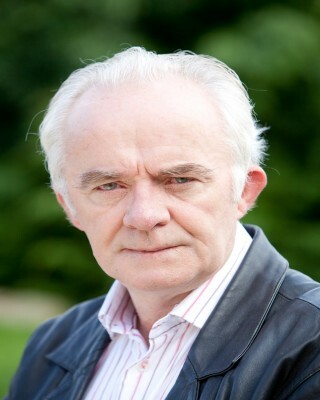 He can be seen regularly as Tadhg Ó Direáin in Irish language TG4 drama ROS NA RÚN. A native of Inis Meáin, Macdara has been a regular member of the cast since its first season in 1996. Prior to that he spent twenty years with the Abbey Theatre and while there he acted in plays by John B. Keane, Brain Friel, Tom Murphy, Shakespeare and Anton Chekov. More recently, Macdara narrated a TG4 documentary AN LEIGEAR /THE SIEGE 1922, telling the story of the siege of Dublin’s Four Courts during the Irish civil war, directed by Andrew Gallimore for Fastnet Films. Television appearances include RTE’s acclaimed medical drama THE CLINIC with Parallel Films, THE IRISH R.M (BBC), PROOF directed by Thaddeus O’Sullivan and Ciaran Donnelly (Subotica), BALLYKISSANGEL created by Kieran Prendiville (BBC), JACK TAYLOR directed by Stuart Orme (TV3), VAL FALVEY TD by Arthur Mathews, SCHOOL RUN directed by Neasa Hardiman for Grand Pictures and FAIR CITY, GLENROE, NO TEARS with RTÉ. Television movie credits include SHOWBANDS directed by Ian Fitzgibbon (Parallel), French/Irish co-production LA FACON DE LE DIRE (Cinétévé/Fastnet), Christy Mahon in THE HEARTS A WONDER (RTÉ), LOVERS OF THE LAKE (Channel 4), SINNERS directed by Aisling Walsh (Laurel Films), THE BLACKWATER LIGHTSHIP starring Diane West and Jessica Lansbury and DURANGO by John B. Keane for Hallmark. Irish language productions include NA CLOIGNE by Lauren Mackenzie and Darach Ó Scolaí (ROSG), ÚDAR (Eo Teilifís), AN TEANGA (ROSG), CORP AGUS ANAM created by Darach Mac Con Iomaire for Magamedia, AN GOBÁN SAOR (Ilanna Teo), short film COSA NITE directed by Dearbhla Walsh and acclaimed comedy feature CRÉ NA CILLE which Macdara co-wrote with director Robert Quinn for ROSG. He narrated TV movie TROID FHUILTEACH (A BLOODY CANVAS) for Fastnet Films. Macdara appeared in the title role of Brian opposite Marie Hastings in CÚIRT AN MHEÁN (THE MIDNIGHT COURT), based on Siobhan McKenna’s dramatic adaptation of Brian Merriman’s 18th century poem, directed by Micheál O’Gairbhaigh for RTÉ. In film, he was seen in Ron Howard’s adventure drama FAR AND AWAY starring Tom Cruise and Nicole Kidman (Universal Pictures), LOVE AND SAVAGERY written by Des Walsh for Morag Loves Company, THE BUTCHER BOY directed by Neil Jordan. He appeared opposite Amy Adams in romantic comedy LEAP YEAR directed by Anand Tucker for Spyglass Entertainment. Short films include TABOO for Northern Film School, UK and MAC AN ATHAR written and directed by Colm Bairéad. Early screen credits include POITÍN with Cyril Cusack, Donal McCann, Niall Toibin and TEANGABHÁIL for Radio Telefís Éireann Films, PLAY FOR TODAY for the BBC and crime drama series THE BURKE ENIGMA created by Michael Feeney Callan for RTÉ Studios.